An international architecture design competition for two new landmark commercial towers establishing Parramatta as Sydney’s ‘ideas city’ has been launched by Parramatta City Council. Lord Mayor of Parramatta Cr John Chedid said the Stages 5 and 6 towers at represent an exciting next step in progressing Parramatta Square as a vibrant, vital hub for Western Sydney. “Parramatta City has developed as a sophisticated commercial office market, being the third largest suburban office market in Australia, with growth of around 2.5 per cent annually since 2000,” Cr Chedid said. The design competition will be undertaken in two stages. An open Architectural Concept Competition will require architects to deliver an A1 board with a visionary concept idea, a statement of design philosophy and approach, and a capability statement and project team. An independent jury panel will then nominate four architecture practices or teams to participate in an invitation-only Design Excellence Competition. Each of the four teams will receive $30,000 after submitting a complying Design Excellence Competition entry. The Architectural Concept Competition opens 30th September and closes . Those teams invited to participate in the Design Excellence Competition will be notified by , with submissions due by . Council will announce the winning design later that month. Once completed, Parramatta Square, in the heart of the City’s rapidly expanding CBD, will include generous public spaces, corporate centres, retail and dining, new Council facilities, and strong connections to the Parramatta transport interchange. It is expected to provide accommodation for 13,000 workers. 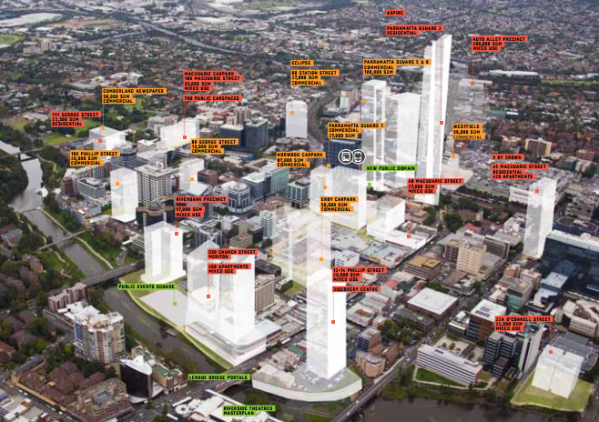 “Parramatta Square represents a desirable and lucrative place to invest and do business. It emphasises Parramatta’s role in meeting the business, cultural, entertainment and tourism needs of the fastest growing region in the country,” Cr Chedid said. A range of internationally recognised architecture firms have been appointed to design each new landmark building to date. Stage 1, a commercial building at , was awarded to Architectus. Stage 2, the Aspire residential tower at , was awarded to Grimshaw Architects. Francis-Jones Morehen Thorp appointed to design Stage 3, incorporating new community and Council facilities and commercial space.